We booked the Family Pirate Adventure through SeaSpray Cruises; roughly $100 for adults and $45 for kids. You can save 15% by booking with them directly – which we did. They still pick you up and drop you off at your hotel. Due to an unfortunate sunburn incident for Mark (a rookie mistake) it was only Sydney and I. We departed at 8 am, drove to nearby Rodney Bay and were on the pirate ship, the Lianas Ransom at 8:30 am. 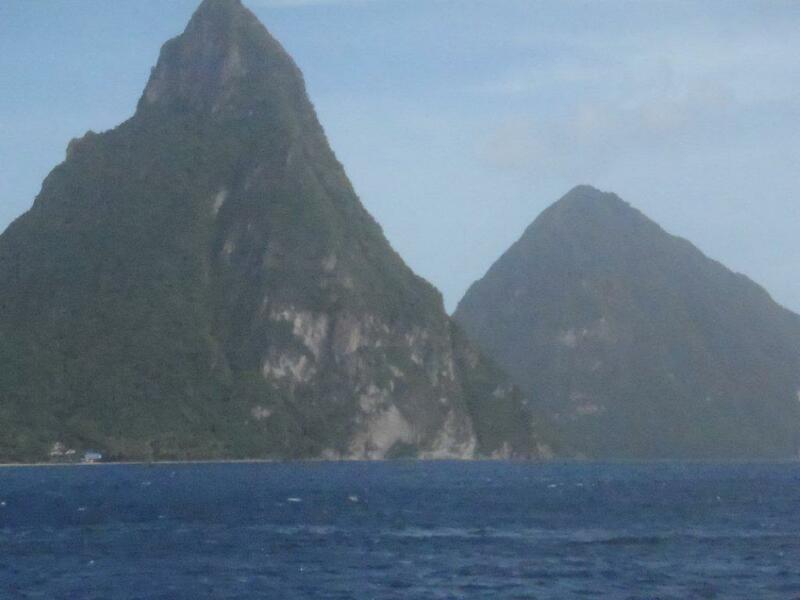 We sailed down the west coast to Soufriere. On the way the pirates (crew) entertained the kids with face painting, dressing up as a pirates and sword fighting. 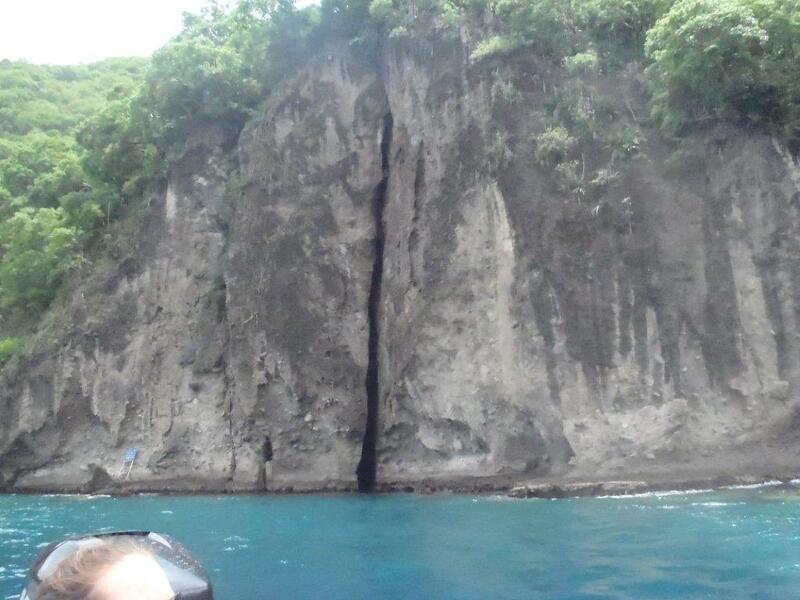 Once in Soufriere, we visited the volcano, botanical gardens and Diamond Waterfall. I really enjoyed the cool canopy of the rain forest in the botanical gardens after being out in the heat. On the way back, we had lunch and stopped for a swim. There was also a hunt for treasure and water fight on-board. We docked back at about 4:30; tired, happy and thoroughly entertained. This is a great tour for families with kids for ages at 12 and under. This is what I have found to be the good, and the not so good about the Morgan Bay Beach Resort. The pools need to be redone, which is being taken care of in September. It is the hotel policy not to stock the mini-bars. This is annoying. No bottles of water in the room. No juice for Sydney, no beer for the delightful balcony. The buffet (although good service) has hit and miss food. Wifi is only in the lobby and one of the bar areas. I prefer it in the room. The a la carte food so far has been wonderful. The one bedroom suites are great and spacious and have an amazing view! In general the service has been great. Tonight was exceptional. Due to a mix-up, (Mark’s fault of course) 🙂 we were an hour late for dinner at Bambou Asian restaurant. They seated us when we arrived without question. We realized our mistake once we were seated and apologized to them for our error. They were exceptionally gracious and you would never know we put them out. This was a highlight of the service received so far and goes to show how much the little things mean when it comes to providing great service to a client – this is true in any industry, I think! Sheraton Gateway Toronto: Although it tends to be a little more expensive than the other airport area hotels, I was once again reminded that the convenience is worth it. It’s located in terminal 3 so if you are flying WestJet, it is right outside your terminal. We flew Air Canada into terminal 1, and they now have a free monorail that zips you between terminal 1 and 3 within a minute or two. No waiting for shuttles or paying for taxis. Five minutes after we picked up our luggage we were waiting in the hotel check in line – priceless when you have a short stopover and just need some sleep. 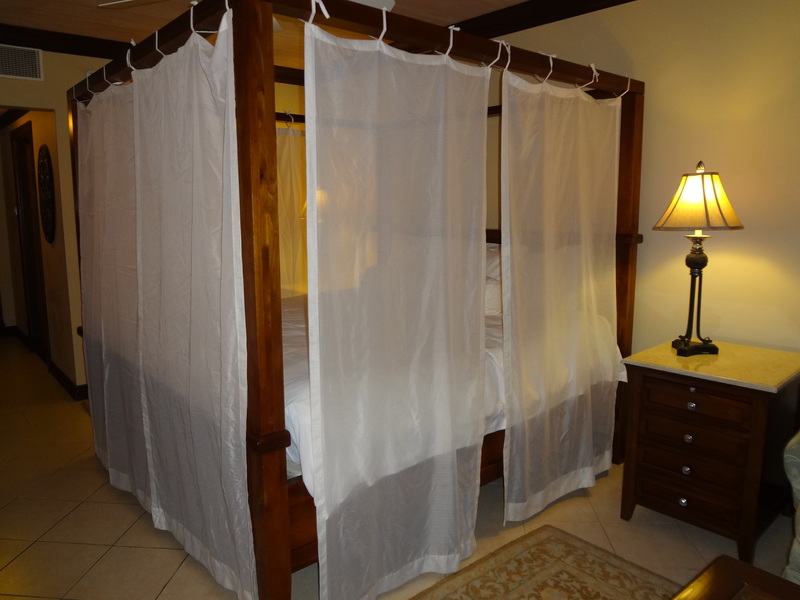 When we originally made our reservation at Morgan Bay Beach resort in St Lucia we were booked into a deluxe garden view room. At the time upgrading to a one bedroom suite was $278 a night extra, which was more than I wanted to spend. A week before our arrival I noticed they still had suites available. I called them again about the cost of the upgrade. They had a special deal, $50 dollars a night. Sold! 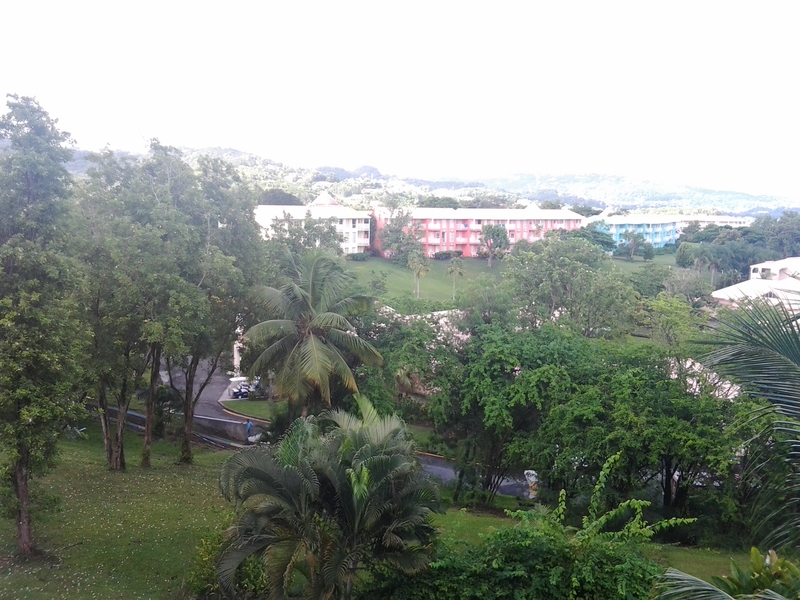 We arrived in St Lucia after a 5.5 hour flight from Toronto and a 1.5 hour transfer on curvy, windy roads from the airport. 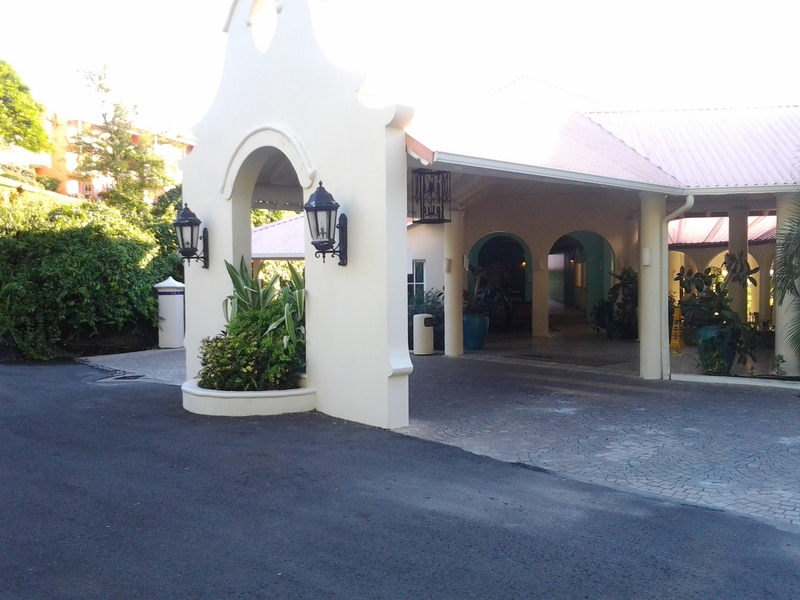 (We had a very good transfer driver that we booked privately through Janus at Saint Lucia Airport Transfers. His name was Danny and he had lots of good info on the island – he’s on my recommend list and was one of the cheaper transfers at $70 per car per direction.) Anyway, we were warmly greeted with rum punch and taken to our room….which turned out to be the deluxe room originally booked. A quick phone call and they promised to get our suite ready and come get us in about half hour. In the meantime I looked around the deluxe room and decided it was solid three star. Bedding was older and patio was small, but they had a new flat screen TV and the bathroom was clean and nice looking, which is always most important to me. This resort was just taken over by Elite Island Resorts; they are doing a lot of renovations and are closing for a few weeks in September to complete major work (like the pools). They really need it; it will be nice when they are done. When we arrived at our one bedroom suite it was a huge sigh of relief. Gorgeous, five star quality room. It is very clean, very bright, with a huge patio, Roman tub that I have a hard time getting Sydney out of…and the view is to die for. I will mention a couple last points before I sign off. The staff is all very friendly and accommodating. There are tons of children at this resort which is good if you have kids, but not so good if you prefer adults only. Well we are in the lobby of our hotel waiting for the shuttle to take us to the airport. Some of the entertainment staff are here to see us off with trays of sandwiches, cookies and bottled water. What an awesome week we had, it went by way too quick! The weather on my iPhone said showers everyday and rain on Friday but as usual my phone was wrong. The weather was beautiful, sunny with a few clouds and a couple 5 minutes showers (not enough to even go for cover). I have really bad luck with cameras when I am on vacation! I dropped one in the Persian Gulf when I was in Dubai a couple years ago. I was in Vancouver a couple months ago, while I was there my camera quit working. Just before we left I bought a new one. So we had the new one, an underwater one and the video camera from the office to make a video. First of all we forgot to pack the charger for the underwater camera and it died about two days in to the trip. On Friday I lost my new one while doing hotel inspections of Sandals La Toc and Sandals Halcyon. I had some amazing images from the millionaire’s suite at La Toc. I called the concierge desk to get them to call the hotels and the shuttle company but they couldn’t find it. I left my card with them just in case it shows up after we leave. It is a good thing I have RBC travel insurance to replace it, but I sure am sad to lose all those pictures. They need to invent a tracker I can attach to my camera! It was fun to watch the wedding staff set up all the weddings and to see all the happy wedding couples. If someone wants to get married at a Sandals Resort the weddings are free and they do a really nice job with the decorations. I also checked out some of the wedding photos that “SnapShots” took and they were really good. The highlight of my trip was the Simon Says tour…Volcano, mud bath and the waterfall! I have Simon’s card if anyone is going to St Lucia and would like to do the most popular excursion on the island. Bats! There are bats in the crack of that rock! as well as Piton (twin peaks) that is what the island is known for, even the island beer is even called Piton (it is pretty good!). 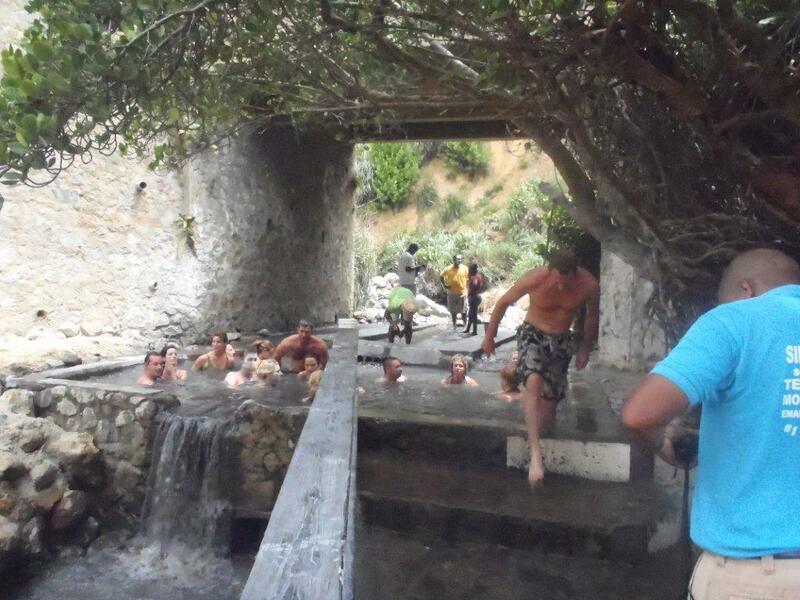 When we got off the boat we were taken to taxi vans to take us to the Sulphur Springs which is in a volcano. It smelt really bad! While at the springs we did a sulphur mud bath which was awesome! Rod played a round of golf this morning at Sandals La Toc. They gave him six golf balls and he came home with three, he said his shots were straight but the earth moved. He had lots of fun, I knew it would be way too hot for me to walk the course with him so I stayed at the hotel. I decided this morning that my dream bed is a little too high, I almost have to zip line to get off of it! I love my canopy bed! After Rod got back hot, sweaty, and happy we decided to go to the beach for the day. It was a beautiful beach day! I have arranged to do hotel inspections at Sandals LaToc and Sandals Halycon tomorrow and maybe after that we will go to the mall and casino. 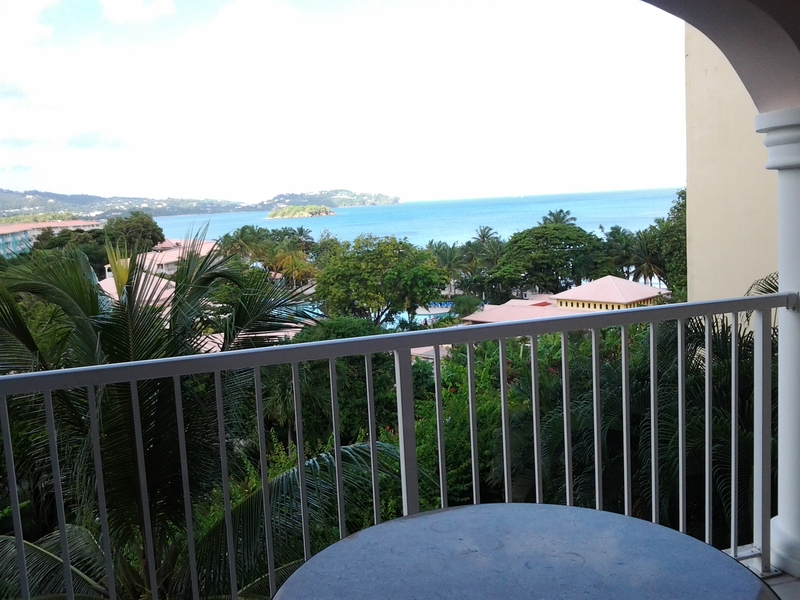 I am blogging from the balcony of our Grand Luxury Oceanview Concierge Suite after our first full day at Sandals Grand St. Lucian. The commercials say it is the Jewel of the Caribbean and they are right! From the balcony I see an amazing beach on the Caribbean Sea along with lush mountains and lots of yachts (when I win the lottery I am going to have a yacht and have Captain Ron sail us down the Caribbean) across the hallway I can see the Atlantic Ocean – I wonder what happens when the two mix – I guess I will find out sometime this week! On our way down we flew with WestJet and had our first stop in Calgary for four hours so we decided to check out the Chinook Lounge. 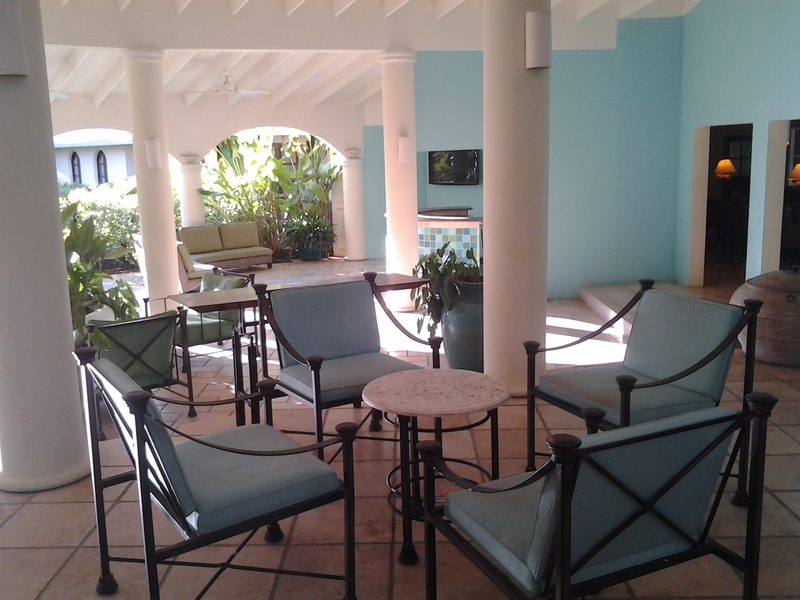 It cost $30 each and included a quiet area with comfortable chairs, lunch, snacks and a full bar…well worth the money!!! When we went to check in to our next flight we were told about a new thing WestJet has. They are taking the TVs out of the seats and are offering to rent laptops (with headphones) for about $10. They were offering them free from flights from Calgary to Toronto as a demo so we tried them out. They have newer movies (I watched “We Bought a Zoo” and Footloose”) there was also some games, TV shows and music, the best part is you don’t lose the signal! The flight from Toronto to St Lucia was on time and awesome except for when we got close to Bermuda and lost the satellite signal. 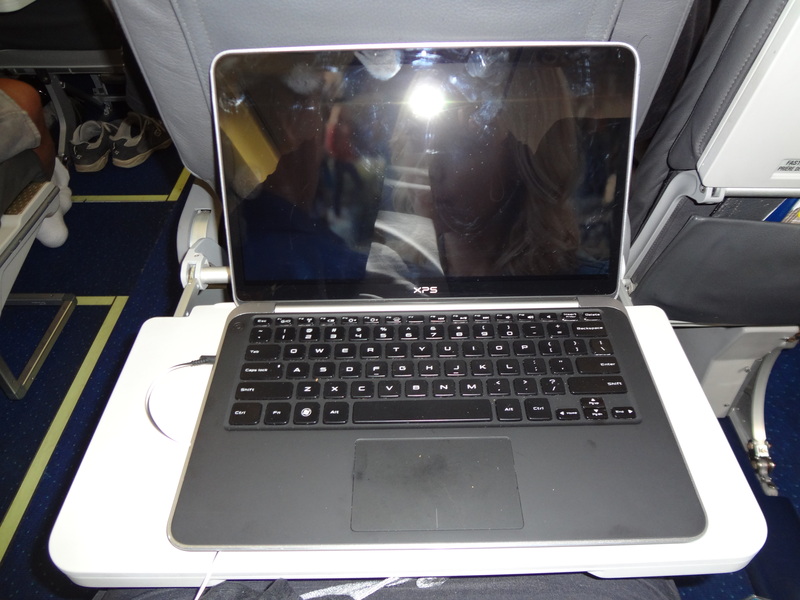 I had my iPad but it sure will be good for everyone to have the chance to rent one of those new Dell laptops, they are about 13 inch so I guess they are closer to a netbook. The keys are lit up so you can see what you are doing in the dark, I think it is very cool. The transfer from the airport to the hotel was about 2 hours so after a long day we just had a bite to eat and relaxed in our awesome room. 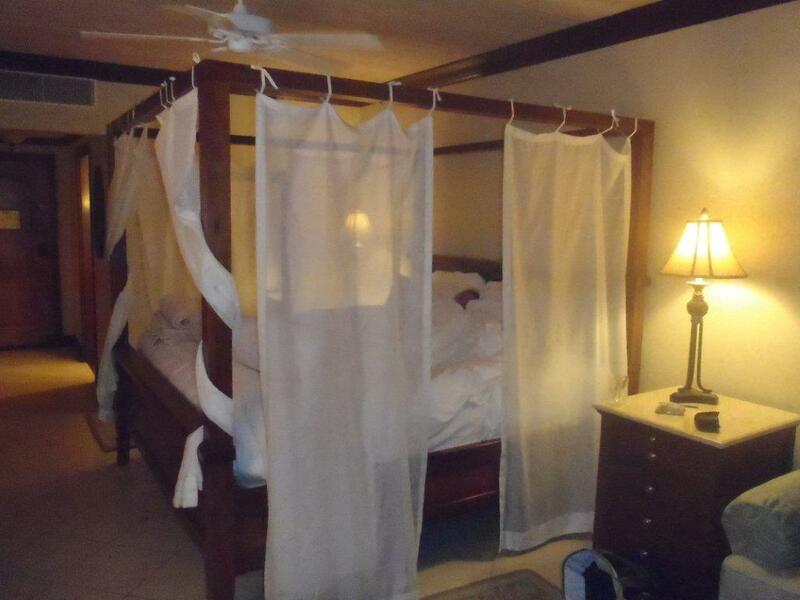 The best part of this room for me is the FOUR POSTER CANOPY BED; I have wanted a bed like this for as long as I can remember.